She has a B.S. in chemistry from Xavier University of Louisiana, an M.D. degree from the University of Alabama at Birmingham and an M.B.A. from Tulane University. She attended Morehouse School of Medicine and completed her family medicine residency in Macon, Georgia. Dr. Benjamin is the recipient of 22 honorary degrees. She is former associate dean for Rural Health at the University of South Alabama College of Medicine in Mobile and past chair of the Federation of State Medical Boards of the United States. 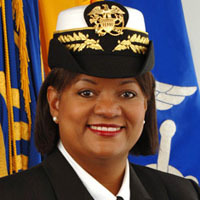 During her tenure as Surgeon General, Dr. Regina Benjamin was ranked as one of the “100 Most Trusted People in America” (Reader’s Digest May, 2013).